I was already a fan of Southern Star’s Buried Hatchet Stout, as I have had several pints of this beer, as it is on tap at one of my favorite Metal bars in San Antonio, Zombies. When this Bourbon barrel-aged version hit our shelves in town, I missed it at first, and I was afraid I would not get my hands on one of these bad boys. Thanks to my good friends over at Big Hops Growler Station, they had a few bottles left, so I quickly went to pick this one up. 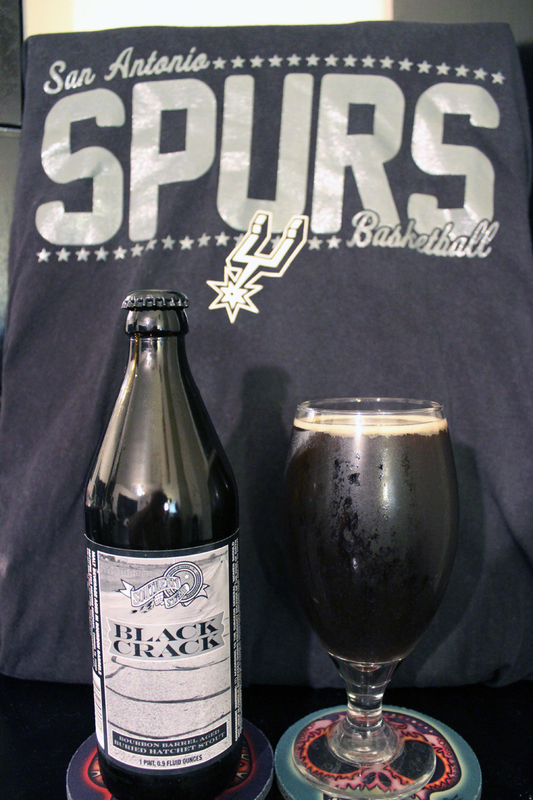 This bottle was saved for a bit and finally cracked open (no pun intended) during the San Antonio Spurs vs. Miami Heat NBA Finals. I want to say game 5. This was the last Spurs victory of the series. I still think the games are fixed. hahaha! Using a Porter/Stout glass, this beer poured a beautiful opaque dark brown, near black color with a thin layer of light tan head. The head stuck around for a good while, leaving nice sticky, spotty lacing down the glass. I pick up a lot of the barrel character in the nose. There is a strong smell of bourbon, oak and vanilla that hits you right away. The aroma of the Buried Hatchet Stout is present behind the barrel smells though, as there is a hint of chocolate, and coffee present. I loved the aroma of this beer. I love what the bourbon barrel did to this beer. There is a woody flavor present along with a good bourbon alcohol burn. I can really pick up on a sweet coconut-like flavor which is given off from the bourbon barrel as well. To me, this compliments this beer perfectly, as the Buried Hatchet flavors of dark chocolate, and light coffee seep through in the background. The body was a bit thin, which really made this beer easy to drink. Not sure if that is a good thing or not. I think I went through this glass a lot quicker than what I should have. I was expecting a heavier body for sure. The mouthfeel was smooth, and silky, which also helped the quick drinking. I will say this about this beer… I feel as if the ABV% presented on this label is inaccurate. I think it is definitely a lot stronger than suggested. I don’t know how often they plan on brewing this beer, or if they will even do it again. There really isn’t any info on this beer on the Southern Star website. I do know that it caused a great buzz before it’s release, and seemed to be as rare of a find as a Loch Ness Monster sighting. I hope they are doing this brand again, so I’m hoping as I type this, there are bourbon barrels of Buried Hatchet somewhere in Conroe, TX. Metal Connection: This is the second time Southern Star and the band, Vader are working together. The first time being when I reviewed their Blind Ambition Bière de Garde. I know this song I chose is not their own, but it is in fact one of my favorite cover tracks. Here is Vader covering the classic song, “Black Metal” by Venom. This can be found on their 2009 album, Necropolis out on Nuclear Blast Records. Laying down my soul to the God’s Rock n’ Roll, BeerMetalDude! Need to find me one of those!